Hello Desirée and 36th Avenue fans. 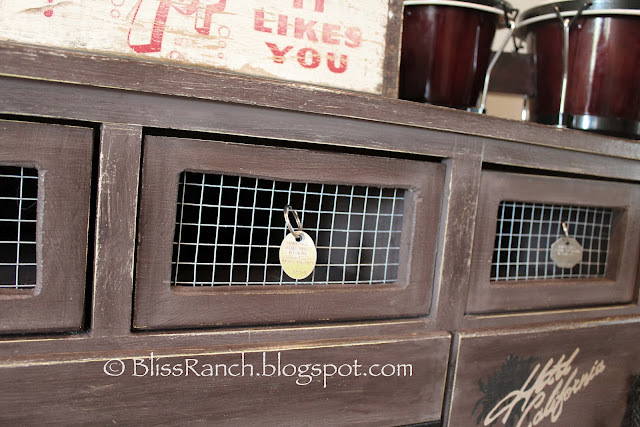 I’m Bliss and I blog at Bliss Ranch. I am honored to be here and share my rocking dresser redo. As bloggers we love a feature, but when Desirée inquired about a guest post instead, I tried to act casual and responded with a polite ‘sure’, while really thinking, “ummmmm, yeah, YES, are you nuts…. YEAH”! So thanks Desiree, I’ll try to tone down my enthusiasm about being here, but you and the dresser both rock! Sometimes the design magic works, and sometimes it doesn’t. On this dresser the trash to treasure makeover turned out to be a treasure for my 13 year old son. I spotted this ‘ol lemon beauty FREE on the curb at a neighbors, (except we don’t have curbs because we live on a gravel road) and left a voice mail for one of my sons that *Dad* said he should pick it up – that worked better than explaining to him why I didn’t do it myself. 15 minutes later on my way back by there was no lemon ugly, it was gone. I was full of anticipation driving up our driveway to see if the piece of lemon-ness would now be mine or if someone else loaded it before my son. with my 18 year old asking “why does dad want that piece of junk?”. JUNK? He had no vision and at that point neither did I. First – replace the crumbled spot on the side with whatever junk wood is laying around. When I saw the wheels in the garage I had to have them on it too. I thought it should be taller and the wheels were just the ticket. I used CeCe Caldwells Hershey brown chalk paint, Annie Sloans clear wax, followed by heavy distressing to give it that lived-in-hit-the-road rock & roll look. The centers of the top drawers were cut out and wire inserted, with pull tags of bits I found in the junk drawer….. rabies tags from past dogs, a cross. My 13 year olds closet was raided for old belts, and those became the drawer pulls, all nicely air stapled on with an opening at the center to grab, or a loop to pull decorated with some nail head trim. It was shaping up. Honestly once I couldn’t see that blazing yellow I considered it an improvement. But really the hardest part was deciding what music “things” to put on it, so I asked for input from the young rocker himself. One drawer says “for those about to rock” a’la AC/DC. The phone number? Just say it out loud to yourself and I think it will be familiar. Young Rocker wanted something California-ish in honor of my roots so Hotel California with my rendition of the album cover seemed appropo. Not too detailed however since I did have to paint it freehand. I love the faded distressing. Two of my sons are drum bangers, so one side has an old pair of drumsticks with a song all 70’s percussionists know. The other side has old concert tickets and other vintage styled ephemera pinned on to give it the look of saved mementos on a bulletin board. Thanks Desiree for having me over at 36th Avenue which is chock full of your own great posts. Everyone is welcome to stop in at the Ranch and say hello – I might have a couple other projects worthy of your visit. I can’t take all the credit for this dresser as my husband is the brawn of our operation, but that means I’m the brains. Thank you so much Bliss and Brawn for hanging out with me and my readers today! I’ll be back tomorrow on my blog. My break is over time to get back to work and hang out againg with some of my favorite people… YOU. Love the way you tagged the concert tickets on the trunk. Added just a little bit of fun. What an amazing job that dresser turned out to be. Thank you for having me Desiree! It’s an extraordinary makeover so you landed in the perfect place to guest post! You worked some magic and produced an amazingly unique piece! Congrats!! Wow! Bliss is such a talented woman, and a former Californian (my kinda girl!) I love that she reused items from her home, like the dog tags and belts. I have a few things around here that I can definitely reuse! Thanks for the inspiration! I smile every time I see Bliss’s dresser. Her creativity with this was incredible. Hey Emily. Love the new fabric cioche. I think its great that you are being flexible and going with the flow. I find this often makes for a better outcome. Excited about seeing the finished room. Your work is modern yet timeless – my favorite! bliss is an amazingly creative woman! love her and her awesome dresser!